When we wake up, the most important thing is to get some carbohydrates into the body as soon as possible. After sleeping for 7+ hours your glycogen (energy) levels in your muscles are severely depleted. Many people skip this meal because they "just don't feel hungry", this is a big mistake - trust me you will just cause your metabolism to fade (i.e. making the body more likely to store fat) and also you will burn more muscle tissue for energy as you are technically in "starvation" mode. If you do find it hard to stomach a breakfast, start of very small each day - even just a slice of toast and cup of tea to begin with can help to kick-start your metabolism, over the course of a few weeks you will find that your appetite in the mornings is increasing and you look forward to breakfast each day. Also lets remember that it's the prime opportunity (in additional to post-training) that you can eat some sugar without any guild (in fact you need it). Fruit, honey, jam... All these things that you should be avoiding at all other times can be eaten at breakfast, so let me give you some ideas from my own diet. Oats provide one of the best sources of complex carbohydrates, they also contain a nice amount of protein and are high in fibre. Very simple to prepare, fast and filling - oats provide us with one of the most versatile and healthy breakfast options. 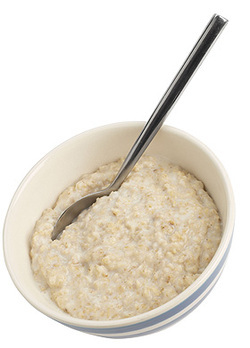 I like to measure my oats by using protein scoops, this way you know exaclty how much you're having without having to crack out the scales (yawn). Milk or water to mix? Well most people prefer the taste of milk, however if you're trying to lose bodyfat I personally advise to stay away from dairy products. There are other options besides water such as soya milk (not a great option for men for hormonal reasons), oat milk, almond milk or my favourite hemp milk. Now the good part, as this is breakfast we can splash out with some sugars: ideally in the form of fibroud fruits, apples, pears, berries. My personal favourite is chocolate raisins - the chocolate coating melts into the oats and the raisins go soft mmmmm. You can also play about with honey (Manuka please), syrup, raw sugar - really the world is your oyster when it comes to breakfast - just don't overdo the sugar. Don't forget to add your protein powder! (unflavoured, blended protein) AFTER you heat your oats. OK, this one I have every day without fail for breakfast. It’s loaded with vitamins, fibre, anti-oxidants, protein and you can be very creative with it – if you’re closing in on a competition and are very sensitive to carbohydrate it’s easy to reduce the carb content. Fruits: Anything really, just be careful not to overload the amount of sugar (you want to be hungry again in 3 hours, if you’re still full – reduce the amount of fruit you use). I prefer to buy bags of frozen berries (because they are cheaper than fresh). 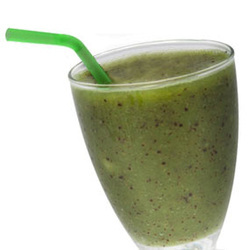 Liquids: fruit juice, water and/or natural yoghurt (or a combination, again gauge how full you are, you need to be eating again in 3 hours so don’t overdo the fruit juice or yoghurt). As I approach competition time and want to get really lean I will taper down the amount of sugar from fruit, fruit juice and yoghurt and replace with oats instead. Protein: You can use raw eggs (4-6 eggs, with only one yolk), I prefer to use unflavoured blended protein powder as it’s just so easy. You can find it in the store area under protein. Other bits: Ginger (great for digestion, optional), Garlic (again the same), oats (or fine oat powder, adds complex carbohydrates, great idea if you’re sensitive to sugar or diabetic). Chuck everything in a blender and press the “on” button. Tip: If you find that nothing is blending and the blades seem to just be spinning; add more water.